The advice and information in this post has been compiled by me. It's a reflection of my research and experiences using cloth diapers and is what I consider to be the "best of the best" of all I've learned so far. Of course I am only one person in a sea of cloth diaper users, and while I hope this post will be a great resource, I'm by no means the final authority :) OH, and Fluff Love University is the best. The information on their site is worth its weight in gold. For real. I cloth diapered for 2.5 years without knowing about them, and I don't know how I survived. I reference the FLU site often in this post and I love them with all my cloth diapering heart. The diaper needs to stay on somehow! There are a few different ways to secure cloth diapers. 1. Snaps: Snaps offer a custom fit but are generally more durable than hook and loop closures. Plus, it takes longer for kiddos to figure out how to undo snaps! 2. Hook and Loop (sometimes called Aplix): This is basically a Velcro closure. Some people prefer the quick, easy, and custom fit that hook and loop closures offer, but others stay far away from it because it has a reputation for wearing out quickly or not securing well (although certain brands have AMAZING hook and loop, like Softbums and Ragababe). Plus, it's easier for kiddos to figure out how to undo this closure. 3. Closure-free: Some fitted diapers, contour diapers, and all prefolds are closure-less. In this case, a Snappi, diaper pins, or a Boingo are options for securing the cloth diaper. I personally use a Snappi on diapers without closures. 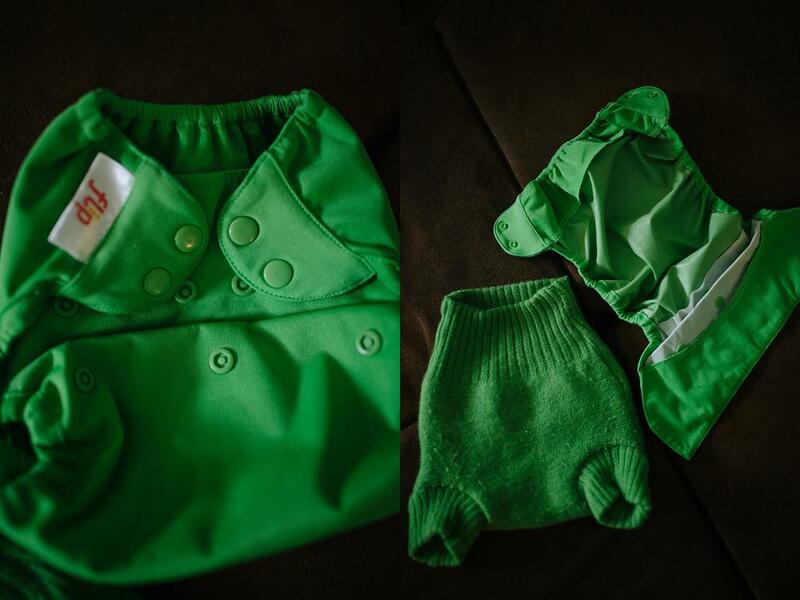 There are basically three sizing systems for cloth diapers: one-size, sized, and a mixture of the first two! 1. 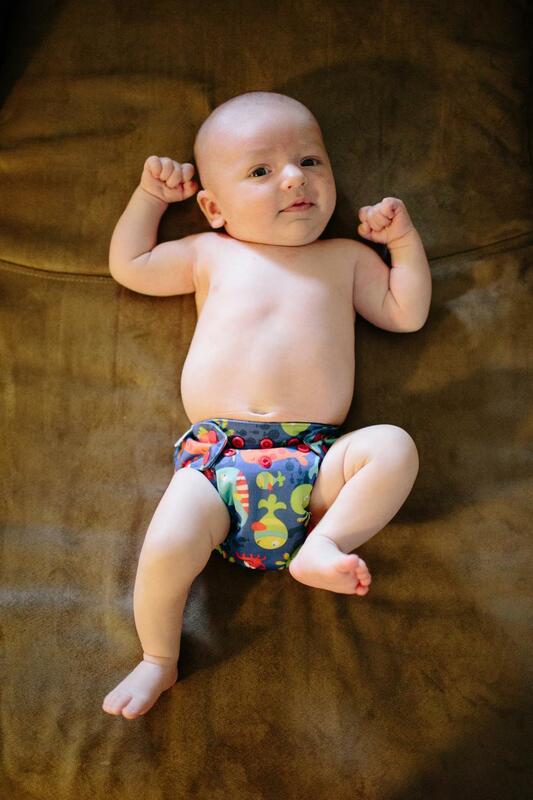 One-size (OS) diapers are intended to fit from birth to potty training. Sound magical? It’s not magic, but it’s definitely creative! OS diapers have systems of snaps that allow the diaper to be made smaller and larger by snapping and unsnapping specific rows of snaps. Each diaper brand has a unique design but the idea of all OS diaper is the same: allow a single diaper to fit a child as he or she grows (and grows and grows). One notable advantage of OS diapers is the fact that only one set of diapers is needed from birth to potty training, which is cost effective. This flexibility of size also comes in handy for families that have more than one child in cloth diapers, especially if the children are different ages/sizes. The same set of diapers can be used effectively on children of all sizes and ages (within the specifications of the diaper, of course) simply by snapping or unsnapping them. One possible disadvantage of OS diapers is that they are often bulky on smaller babies because they contain enough fabric to fit a larger child. However for some users, this isn’t a concern and OS diaper are without a doubt the most cost effective and practical solution. One example of a OS diaper is the Blueberry OS Simplex. 2. Sized diapers are meant to fit narrower size ranges than OS diapers. Newborn diapers, for instance, are generally made to fit babies from approximately 6-12 lbs. (although specific weight guidelines vary by manufacturer). Sized diapers are therefore usually trimmer (meaning they fit more similarly to a disposable diaper and don’t give as much of a “huge booty” effect) because they don’t have to contain enough fabric to fit an 8 lb. baby AND a 30 lb. baby. Sized diapers might also fit better around the legs or waist because they are tailored to a smaller and more specific weight range. A disadvantage of sized diapers is the need to buy multiple sets of diapers: diapers to fit from 6-12 lbs., diapers to fit from 12-18 lbs., and so on and so forth. The trimness of sized diapers and the potential for a better fit make the cost of buying multiple sets of diapers worth it to some users. A popular option is to purchase a set of newborn diapers for the early days and a set of OS diapers to use when the newborn diapers have been outgrown. Two examples of sized diapers are the Blueberry Newborn Simplex and the Blueberry Side Snapping Simplex. 3. The third option is a mixture of OS and sized. This option usually involves a OS diaper cover and sized absorbent inserts. For instance, users of fitted diapers will often purchase sized fitteds but use a OS diaper cover over them. Diaper covers are often thin and don’t have much bulk, so this “best of both worlds” system gives the advantages of a proper and trim fit without the need to purchase new sets of diaper covers as baby grows. One example of a system that uses OS diaper covers and sized inserts is Best Bottoms. Every manufacturer has unique weight ranges for their diapers, both OS and sized, and the fit of every diaper will vary slightly from brand to brand and baby to baby. Short answer? I recommend enough for 24 diaper changes. Buy more if you find you need more! A newborn baby will go through approximately 12-15 diapers a day while an older child will go through approximately 6-10 diapers a day (these are really rough estimates, every child is different). It seems that the golden number to have per child is 24 diapers, which is enough to last two days. This allows you to wash every other day and not run out of clean diapers. You may have to add a few more diapers to your stash if you find you don't have enough to last as long as you'd like between washings. Assuming you decide to buy enough diapers to last two days and that you only have one child in diapers, if you decide to use AIO diapers or pocket diapers you will need 24 diapers total since the entire diaper must be changed with each diaper change. If you decide to use AI2 diapers, fitted/contours, or prefolds/flats, you will need 24 of the absorbent portion and approximately 1 cover to every 4-6 of the absorbent cloth portion. The diaper covers can generally be reused through several diaper changes but will eventually need washing. If you decide to use newborn sized diapers (which generally fit until around 12 pounds), you will want to have 24 newborn diapers and the same number of diapers to fit your baby once he or she outgrows the newborn diapers. If you decide to use a one-size (OS) diaper system, you will only need 24 diapers because OS diapers will fit baby from roughly 8-30 pounds! If you decide to use sized diapers, you will need approximately 24 diapers for each size range. You may need less once your child is in a larger size since that usually means the child is older and goes through less diapers... but it really depends. I prefer to have a few too many than not enough! Some diaper systems use OS covers with sized inserts, so only the inserts need to be upgraded as your baby grows. I use a plastic bucket. I simply spray any poop into the toilet using my diaper sprayer (once my baby starts solids, exclusively breastfed baby poop doesn't need to be rinsed) and then toss the dirty diaper into the plastic bucket, which I keep in our bathroom near the toilet. Some prefer to use a pail lined with a diaper pail liner (which can be tossed into the wash with the diapers when soiled) or a wet bag, which is a great on-the-go solution and what I use when I'm not at home. If you take anything away from this post, let it be how to wash cloth diapers. Correction: how to PROPERLY wash cloth diapers. In the beginning, I believed a lot of common cloth diapering myths. I believed water, not detergent, was what got diapers clean. I believed HE machines just couldn't clean cloth diapers. I believed I had to use a special "cloth diaper safe" detergent. I believed that I needed to rinse, rinse, rinse until there were no more suds. I believed it was normal to have smelly diapers that needed frequent "stripping" and bleaching. I had never heard that hard water needed a water softener, or that you shouldn't run rinse cycle after rinse cycle after rinse cycle after rinse cycle. You can use (almost) any detergent that exists to clean your cloth diapers. And oftentimes the "normal" stuff gets cloth diapers cleaner than the fancy "cloth diaper safe" stuff. Wondering what detergent to use? THIS CHART will help you decide! Detergent + water + friction get diapers clean. Not one, not two, but ALL THREE COMBINED. You need to make sure you're using a "good" detergent and enough of it, you need to make sure the amount of water in your cycle allows the clothes to be properly saturated yet not overwhelmed with water, and you need to make sure there are enough diapers or SMALL items of clothing/rags in the cycle so that everything is rubbing against each other and getting clean. You do not need to rinse, rinse, rinse until you don't see suds. In fact, those obsessive rinse cycles wear your diapers out SO FAST and if you have hard water, they can literally be the bane of your existence because the minerals from the hard water are not being treated by detergent/water softener and are just getting loaded onto your diapers, and eventually will cause issues. Take it from someone who knows. Hard water needs to be softened. Calgon or borax will be your BFF and you can get free water quality test strips HERE. SHORT WASH: Do a short wash cycle (NOT a prewash or a rinse, a full but short cycle... you want short but effective) to get the poop and pee rinsed off of the diapers. If you can adjust soil level, set it to the heaviest soil. Use a little detergent. Use a water softener if you have hard water. Use hot water if possible. Set to the highest spin level if you can adjust spin level (get that dirty water OUT of your diapers). Do not add any extra rinses. LONG WASH: Do a long wash (like a heavy duty cycle) to thoroughly clean the diapers. If you can adjust soil level, set it to the heaviest soil. Use plenty of detergent. Make sure there is enough "stuff" (diapers/rags/small items of clothing, NOT big bulky things like bath towels, adult jeans, sheets) that the washer drum is almost full. Use a water softener if you have hard water. Wash on hot water. Set to the highest spin level if you can adjust spin level. Do not add any extra rinses. DONE: That's it. Dry your diapers! 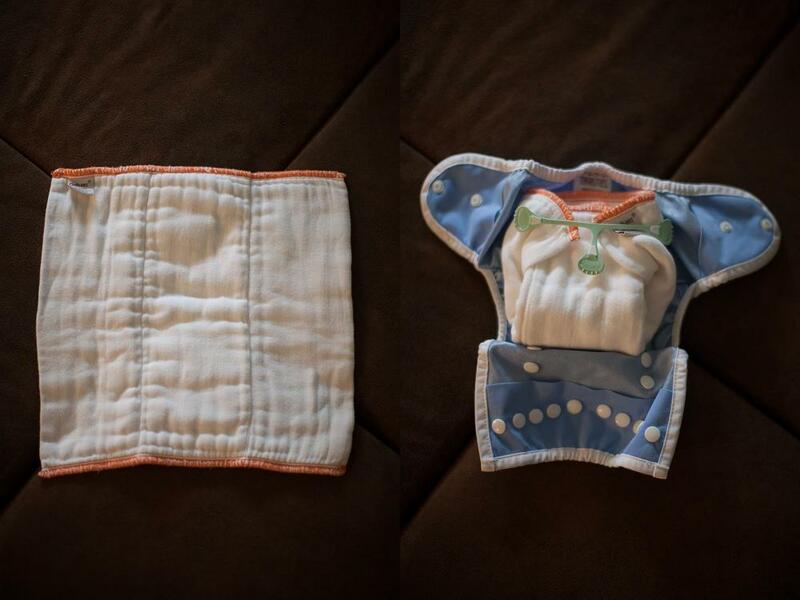 I air dry my diaper covers and dry everything else in the dryer on medium or low. I use the sun to get out breastfed baby poop- take them out of the washer and put them in the sun while they're wet. The stains will be gone in no time! This even works in winter and on anything, not just cloth diapers. WONDERING WHAT DETERGENT/HOW MUCH DETERGENT TO USE? Click here. *TIP: A great detergent to use is powdered Tide Ultra. Use the HE kind of you have an HE machine, and the non-HE if you have a non-HE machine (that might sound like common sense but it's easy to forget that part). It's one of the strongest detergents on the market and is very highly recommended across the cloth diapering community! Use up to line 1 in your short wash and up to line 3-5 in your long wash. CURIOUS ABOUT WHAT SETTINGS TO USE ON YOUR MACHINE? Click here. DO YOU HAVE HARD WATER? Click here. ARE YOU SWITCHING FROM AN OLD AND INSUFFICIENT WASH ROUTINE? Click here. My favorite site ever ever ever for all things related to washing cloth diapers is Fluff Love University. They support a SCIENCE BASED, not myth based, method of cleaning cloth diapers. I learned much of what I know through trial and error and through that site! really wanted to use a more "natural" detergent. The Fluff Love University (FLU) site helped me learn that the detergents I was trying to use (The Honest Company, Dapple Baby, Charlie's Soap) were not effective or recommended for washing cloth diapers... they simply aren't strong enough. I tried a few different Seventh Generation brands before switching to powdered Tide Ultra. Unfortunately I just don't think I can clean my diapers with my hard water and a "natural" detergent. I have water that's pretty hard (250+ ppm) and the FLU site helped me learn that I NEEDED to be using a water softener, either a cap full of liquid Calgon or 1/2 a cup of Borax, in each short and long cycle I ran in order to prevent mineral buildup and would cause smell issues. The FLU community helped me figure out I needed to "bulk up" or add more small items of clothing to each load to get more friction. I learned to wash on hot for extra cleaning power. Washing cloth diapers doesn’t need to be complicated. My advice? Start simple and keep it simple! If you experience issues, change something. Different washing machines, different water qualities, and different babies with unique sensitivities = different wash routines for everyone. Start with a basic wash routine like the one I use and a detergent of your choice, which can be any laundry detergent without fabric softener (I recommend powdered Tide Ultra). If you experience issues (smelly diapers, rashes, leaking) then begin exploring possible solutions involving additives (like a water softener) or a different detergent or different wash routine. Be forewarned that different brands of diapers have different warranties and using something like Tide might void your warranty... although I've never had good luck with the "cloth diaper safe" detergents most manufacturers require users to stick to OR the wash routines they recommend. You'll have to make that decision for yourself. If you're using a "cloth diaper safe" detergent with no problems, then by all means, keep using it! But if you're ready to quit using cloth diapers altogether because you're having so many issues with STINK, I truly believe there is hope and I've found so much good advice here. You can even get free, personalized advice on your wash routine so don't hesitate to seek reputable help! 1. "Always use the highest water level possible when washing your cloth diapers." If your washing machine automatically senses the amount of water it should use in a load, let it do its job. Don't try to "trick" it by adding towels, don't add extra water with a hose or pitcher... let it do what it was designed to do. If you begin interfering with it, even with good intentions, you could actually make the situation worse. For instance, you might think, "My diapers smell. It's because my HE washing machine isn't using enough water." So you add more water. Then your diapers end up swimming around in a huge tub of water, not getting any of the friction from each other and from the motion of the washing machine that they NEED to get clean. If your diapers smell, it likely has little to do with the amount of water your HE machine is or isn't using. It's probably your detergent or water quality, but more on that later. If you are able to manually select the water level on your washing machine, you should select a water level appropriate to the number of diapers you are washing. Aim for "diaper stew" over "diaper soup" or "diaper chili." Don't just blindly believe that you need to add tons and tons of water to each and every load of diapers! 2. "It's okay to use non-HE detergent in an HE machine." Wrong! I learned this the hard way. Let's just say suds ended up in places they shouldn't have been... all over the kitchen floor... ANYWAY. HE detergents are designed to create less suds than non-HE detergents for a number of reasons that can mainly be pinpointed to the fact that HE washing machines work differently than non-HE washing machines. You can actually break your HE machine by using non-HE detergent. Some people (aka me) mistakenly assume that they can just use less detergent if they want to use non-HE detergent in an HE machine. Wrong again! Because then they're not using enough detergent. There might still be suds, but suds don't generally equate clean. If you have an HE machine, use HE detergent. Your washing machine and clean diapers will thank you. 3. "Use less than the recommended amount of detergent when washing cloth diapers!" 4. "You should only ever use a cloth diaper safe detergent to wash cloth diapers." Don't get me wrong, I am 100% in favor of detergents without artificial dyes, scents, and optical brighteners, which cloth diaper safe detergents tend to be free of. The problem with these detergents is that they are often extremely weak and comprised almost entirely of ingredients like oxygen bleach and washing soda, to name a few. Some people have effectively used cloth diaper safe detergents, but most of them have to regularly "strip" their diapers because they encounter issues like stinky, leaky diapers that give their baby rashes. I personally used Charlie's Soap for over half a year, and had to use chlorine bleach on my diapers about once a month because they began to smell strongly of ammonia every few weeks. I eventually figured out that the Charlie's Soap simply wasn't cutting it; I needed something strong and I needed more of it. So I switched to powdered Tide Ultra as recommended by Jillian's Drawers and can confidently say that ammonia issues are a thing of the past in my household! 5. "HE machines are not good for washing cloth diapers." HE machines are absolutely fine for washing cloth diapers! You might need to do a little extra troubleshooting and experimenting, but many people have success cloth diapering and using HE washers. 6. "You should rinse, rinse, rinse until you see no more suds!" Okay, this one sounds like it makes sense to some degree, but let's discuss it more. Each rinse and water-only cycle you run is putting wear and tear on your diapers. That's downside one... it will significantly decrease the lifespan of your diapers to wash them in an overly intense routine, take it from me!!! Whether holes develop faster or the PUL just gives up, it's not a good idea. Furthermore, almost everyone in the USA has hard water to some degree. When you run a wash cycle WITH detergent, the minerals from the hard water are "trapped" and prevented from clinging to your diapers. People with water harder than 120 ppm should use a water softener in addition to laundry detergent (source) to make sure the minerals from hard water are being handled properly. While "detergent build up" can happen, it only happens when certain ingredients are present in the detergent formulation that cause diapers to repel water... too much detergent is NOT why your diapers stink (if they stink)! And rinsing obsessively to prevent detergent build up is likely just going to cause mineral build, which WILL cause your diapers to stink. So it's a lose-lose situation. As long as your diapers don't feel slimy right out of the wash, they are perfectly fine and I give you permission to stop with the extra rinse cycles! 7. "Detergent build up causes diapers to stink." No. No no no. It will not. Seriously. I used to use the "cleanest rinsing" detergent out there and I would rinse obsesssssively. My diapers STUNK. There was no detergent build up on them. There was likely lots of mineral build up due to my washing them in untreated hard water and lots of downright BACTERIA due to how ineffective the detergent I was using was! Some detergents (like ALL brand) contain an ingredient that coats the fibers on the diaper and can cause them to repel, kind of like why you want to stay away from fabric softener. But detergent build up in the sense of causing cloth diapers to stink just isn't true. In fact these days I use as much detergent as I can to not have oversudsing issues and my diapers have never smelled less disgusting. They don't have stains. They're CLEAN, and maybe there is a tiny bit of detergent residue on them, but I'm okay with that because that means stripping and bleaching stinky diapers is a thing of the past. Planning on Trying Cloth? Tips From Me! 1. Try different brands and types! Do your child's cloth diapers smell like poop even when he or she only pees? Or maybe they reek of ammonia after they're peed in? There is hope! Fluff Love University addresses all things related to stinky diapers and how to fix them HERE. I learned through trial and error that cloth diapers are not indestructible. I wish I could pinpoint what did it, but I caused and entire stash of AIO diapers to develop cracks and holes in the waterproof layer over the course of cloth diapering my first son, and had to pretty much rebuild my stash from the ground up as a result. My guess is that I ruined them through a combination of buying used diapers that were already more worn than I thought they were, a REALLY bad wash routine (not enough detergent or water softener) that resulted in my need to use bleach excessively, doing unnecessary extra rinses, utilizing the sanitize cycle on my machine, ALWAYS drying everything in the dryer... Who knows?! I was a hot mess. I love cloth diapering but it sure can be a pain at points. I've absolutely had moments where I wanted to give up, but I'm ultimately always so glad I've stuck with it through the hard times! Fluff Love University has been so amazing along the way, so definitely familiarize yourself with their site if you're new or having cloth diapering issues.